Jupiter (Guru) transit to Libra (Tula Rashi) 2017 prediction for Pisces (Meena Rashi) Sign - Guru peyarchi palangal 2017 for Meen Rashi as per Thirukanitha Panchangam. Let us analyze prediction of Jupiter Transit 2017 for Pisces (Meena Rashi) Sign in details, so we can know what to expect. Pisces is the last sign (12th house) of the zodiac house. The stars or Nakshatras Poorattadhi (pada 4), Uthirattahi and Revathi come under this constellation. The people born under any of these stars have Pisces as their moon sign. Patient, having a way with words, you amass your wealth and save wisely. You win over everyone with your kindness and adjusting temperament. You are born under the benefice presence of Lord Jupiter. Lord Jupiter is the ruler of your sign. Jupiter also looks after your career House. Guru (Jupiter) is beneficial to you when He resides at favorable Houses and lessens malefic impacts when Guru resides at Ashatama Sthanam. This year, Jupiter (Guru) will transit to the House of Libra on September 2, 2017 and stays there till October 4, 2018. Last year, the Jupiter (Guru) Transit brought you many benefits to Pisces sign. Students were able to score good marks. Those in business had good profits. People working as professionals received promotions and pay rise. Husband-wife relationships were good too. Those awaiting marriages or childbirth had their wishes fulfilled. Your debts reduced. Thus last year was a good year for you. On September 2017, the planet Jupiter transits to the House of Libra. Let us see what changes this will bring to your life. This year, the transit will not be very beneficial to Pisces sign. Lord Jupiter transits to your 8th House (Asthama Sthanam). The 8th House Guru (Asthama-Guru) deals with longevity. Though you might not be afflicted with new diseases, you will be scared of your health. A benefice planet hiding in a shadow House will not bring much good. However, the aspects of Jupiter is very strong. 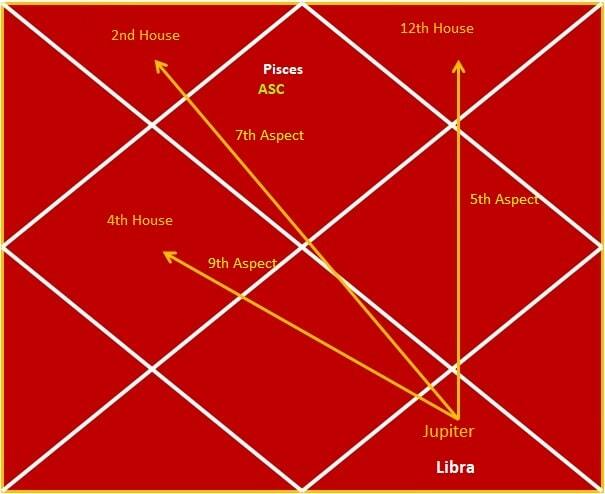 Let us see about effects of Jupiter aspects and the Houses they affect. For Pisces, Jupiter aspects your 12th House (House of Aquarius) from 8th house (Tula Rashi). The 12th House (Vraya-sthanam) deals with expenditure. Due to Lord Jupiter’s favorable 5th aspects, those expenses will be for good, festive reasons. You will travel abroad or to faraway places. Lord Jupiter aspects your 4th House (House of Gemini). The 4th House (Suka-sthanam) deals with property, land and maternal side. You will spend money on building and developing properties, vehicles and business deals. Your mother’s health will improve. Students should focus on studying and working hard. Instead of worrying about your marks, just concentrate and you will succeed. Those in business and professional work should be careful of underground enemies. Promotions and increments will be delayed. Marital relationships will be good. Those expecting marriages or childbirth will get them fulfilled, only after facing a few hurdles on the way.